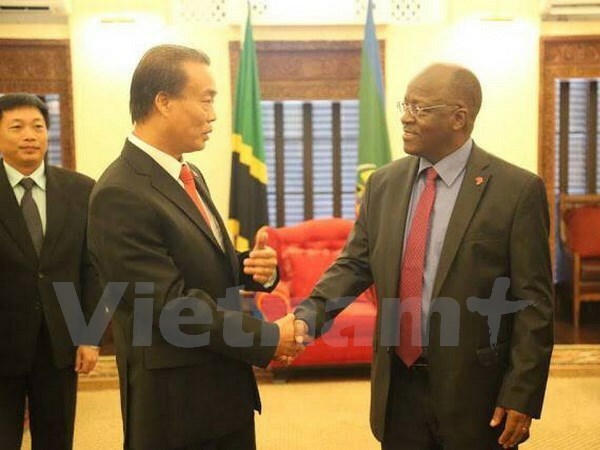 Hanoi (VNA) – Tanzanian President John Magufuli has vowed all possible support to Vietnamese investors who would be investing in Tanzania. He hosted Vietnamese Ambassador to Tanzania Nguyen Kim Doanh who came to present his credentials to him in the capital city of Dar Es Salaam on August 1. The Vietnamese Ambassador said that Vietnam highly values ties with the African country. He thanked the Tanzanian government and President Magufuli for providing support for Vietnamese firms and nationals in the country and expressed his wish that they would continue boosting all-around ties with Vietnam and actively assist Viettel telecoms provider in the country.